Dhawan celebrated the catch in his own thigh-five style. The England vs India T20I series has been going on in full swing. While India started things with a win, England came back at Cardiff to level the series 1-1. Indian opener Shikhar Dhawan is yet to create a mark as a batsman in this tour. However, he gained a lot of accolades for his catch last game. English skipper Eoin Morgan was trying to accelerate the innings as he tried to hit one over the deep fine leg region. 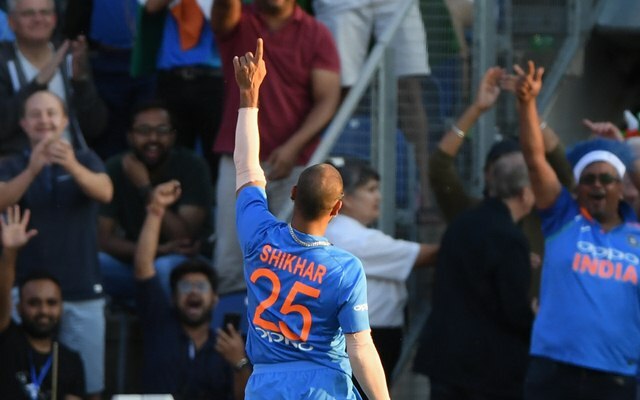 Dhawan who was stationed there judged it really well, stretched backwards and ended up taking an absolutely phenomenal catch to dismiss Morgan. He celebrated it in his famous thigh-five style as the Indian crowd went into a frenzy. It was an important breakthrough in a crucial juncture as England lost their fourth wicket. Just when it seemed like they were settling in, India steered back into the game with that effort from Dhawan. Eventually, it was Alex Hales who stayed there till the end and ensured the hosts won the game in the last over. The action now moves to Bristol for the final T20I game. It was no one other than Jonty Rhodes who was quite impressed by Gabbar’s effort. The former South African particularly known for his magnificent fielding took to Twitter to praise Dhawan. He made an interesting comparison of his splendid catch to that with a kabaddi player. Shikhar Dhawan has a sensational record in England. The elegant left-hander enjoys a batting average of 73.67 in the country. Thus it will be interesting to see what Dhawan has got to offer in the final T20 international at Bristol. No better stage than the series decider to step up.